White sandy beaches, calming water, and breathtaking sunsets — what more can you ask for from an island getaway? The Florida Keys offer you all of that and more, and the best part is, they’re only about an hour’s drive south of Miami. Islamorada, or Village of Islands, is just south of Key Largo and includes a few mini-islands off of its coast. This laid-back retreat is a great place to come to for rest and relaxation, family fun, or a romantic getaway. 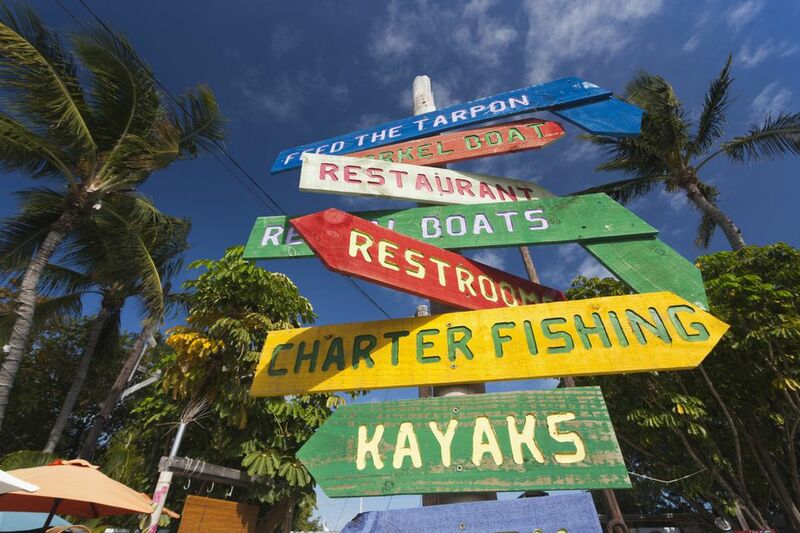 The Islamorada area is packed with water sport rentals, eco-adventure tours, and some beautiful hiking trails. It’s considered the Sport-Fishing Capital of the World so boating and fishing tours are abundant and available year-round. Here are the top nine things to do when visiting this low-key key. From snorkeling to scuba diving, don’t leave this island without having taken in the pristine underwater life that lives off the coast. A massive population of unique and beautiful marine life live in these waters and you don’t want to miss out. Experienced divers can take tours of The Eagle, a 287-foot shipwreck off the coast of the island. Colorful patina, coral, and sponges have encrusted the structure, while schools of tarpon circle the area. Shallower areas like Cheeca Rocks and Alligator Reef Lighthouse are perfect for snorkeling — an abundance of medium-sized fish and colorful coral live in these areas. Robbie’s Marina, located just past mile marker 77 on the Overseas Highway, is becoming somewhat of a Florida Keys staple. The big attraction at Robbie’s is the tarpon feeding. For as little as $5, you gain admission onto the dock and a bucket of a fish to feed the huge tarpons that swim in the waters. These fish are pretty massive and it’s incredible to see them jump out of the water for a slimy treat. There is also a restaurant and small little shopping area at the marina, so grab a bite and some souvenirs while you’re at it. If you’re visiting Islamorada with children, this place is a must. The marine mammal park has been open since 1946 and is still owned and operated by the McKenney family. General admission to Theater of the Sea includes dolphin, sea lion, and parrot shows, a bottomless boat ride, entrance to the lagoon-side beach, as well as a fish and reptile tour. Animal interaction programs, where you can, swim with dolphins, get up close to a sea turtle, or relax with some stingrays, are available as well for special prices. Although beaches, relaxation, and margaritas may be the first few things that come to mind when you think about the Florida Keys, the islands are actually rich in history. The Florida Keys History and Discovery Center, located on Islamorada, is worth a visit. From shipwrecks and hurricanes to pirates and sunken treasure there is a lot you can discover about the Key’s rich history from spending an afternoon at the museum. Islamorada is known for its smaller surrounding islands, which make perfect day trips — especially if you’re looking for quiet beaches and tranquil water. Rent a kayak from Robbie’s and head towards Indian Key, only about a 20-30 minute kayak ride away. The island is not only home to amazing snorkeling and wildlife, but it’s also a historic state park site. Back in the 1830s, Indian Key was a bustling town that held a Dade County seat. But in the summer of 1840, the town was attacked by Seminole Indians and never recovered. Today, ruins from the historical city still remain, overgrown with jungle-like vegetation. Visiting Islamorada, or any of the Keys for that matter, without treating yourself to a fresh seafood dinner would be tragic. Chef Michael’s, the top-rated restaurant in the area, prides itself on their dock to dish selections, but are known for their hogfish special. They’re located in the Morada Way Arts and Cultural District — a great place to walk around and home to many artists and craftsman. Midway Café, located midway through the Florida Keys and right off of the Overseas Highway, is a great brunch or lunch spot for good food, an eclectic vibe, and amazing key lime pie. Whether you’re a seasoned fisherman or just want to give the sport a try, Islamorada is the place to be to get a true fishing experience. You can charter a private boat with a guide or join a fishing trip. Depending on the time of year the waters are teaming with sailfish and marlin, kingfish and wahoo, mahi-mahi, and tuna. Tarpon and bonefish live in the area year-round. Located right off of the Overseas Highway, the History of Diving Museum is a fun and delightful stop to make on your trip to Islamorada. The museum was originally a small collection of one couple’s dive memorabilia, over the years it morphed into an extensive assemblage of diving and pre-SCUBA history. A diver spotting scavenger hunt and interactive exhibits make this a fun location for kids as well. The museum is open daily from 10 a.m.-5 p.m. This little-known spot is a favorite of locals and travelers alike. Although getting out to this picturesque sandbar requires some planning. First, you have to rent something to get there with — ideally a boat so you can spend time in and out of the water relaxing and having fun, but a kayak, jet ski, or canoe would do the trick. The sandbar is located on either side of Whale Harbor Channel and should only take about 20 minutes to get to if you are paddling a canoe or kayak, though a motorboat or jet ski is obviously quicker. Bring a picnic lunch some drinks for a fun and relaxing afternoon. The sandbar can get a bit crowded on the weekends.